Researchers at the University of Tokyo continue to discover new ways to improve the effectiveness of nanoparticles as biomedical tools. Nanoparticles are particles that are smaller than 100 nanometers. They are typically obtained from metals and, because of their tiny size, have unique properties that make them useful for biomedical applications. However, without treatment to make their surfaces biologically inert, their effectiveness is severely limited. Researchers led by Kazuhiko Ishihara at the University of Tokyo have pioneered the use of MPC polymers to modify the surfaces of nanoparticles. In a recent article published in the journal Science and Technology of Advanced Materials, they reviewed current ways in which polymeric nanoparticles can be used to transport a type of small nanoparticles called quantum dots into cells. MPC polymers are large molecules made from chains of 2-methacryloyloxyethyl phosphorylcholine (MPC). Bioactive nanoparticles whose surfaces have been modified with them can be used as anti-tumor compounds, gene carriers, contrast agents that improve MRI images, and protein detectors. MPC polymers mimic cellular membranes and allow the delivery of bioactive molecules that are normally not very soluble in water or that might produce unwanted biological side effects. When scientists attach MPC polymers to the surface of inorganic nanoparticles, they can make substances that are easily delivered into the blood or other tissue. Ishihara's group has recently used this process with quantum dots to produce nanoparticles that can outperform traditional organic fluorescent dyes in biomedical imaging. 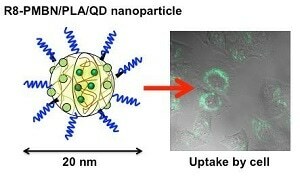 Using a simple solvent-evaporation technique, they were able to fabricate polymer nanoparticles that contained a core of quantum dots enmeshed in the nanoparticle polymer PLA (poly L-lactic acid), which was then surrounded by a layer of an MPC-polymer derivative called PMBN. This combination produced particles that maintained the same levels of fluorescence in a solution after being stored for more than six months at 4 degrees Celsius, and that functioned in environments of varying acidity. While traditional organic dyes lose their fluorescence with repeated illumination, the polymer quantum dot nanoparticles did not. To be useful, nanoparticles need to be transported into cells. To accomplish this, the team tested the performance of several molecules by fixing them onto the surface of the PMBN/PLA/quantum dot particles. Analysis showed that when the cell-penetrating peptide called R8 - an octapeptide made from eight arginine amino acids - was attached to the nanoparticles, they were taken up by cells within five hours and had no toxic or inflammatory effect on the cells even after three days. Further testing showed that cells with the polymer quantum dot particles proliferated normally, and that the nanoparticles distributed evenly into each daughter cell upon division. Unlike organic fluorescent dyes, this did not weaken the fluorescence signal even after 30 hours of proliferation. This was the first report showing the long-term retention of nanoparticles in cells. Preparation of bioactive nanoparticles with MPC polymers can be used to fabricate in-cell nanodevices whose interaction with cells can be completely controlled.